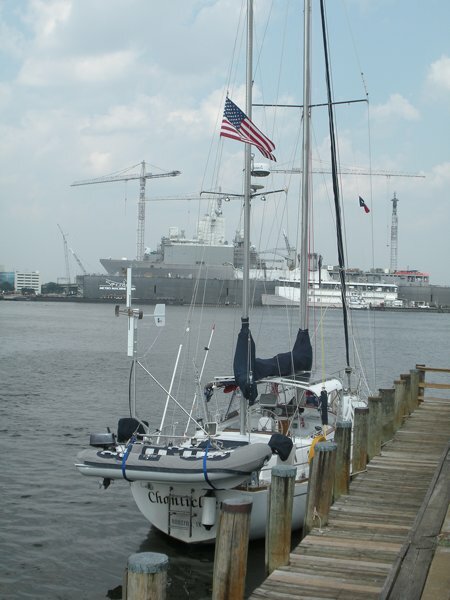 For those of you who have sailed in Clear Lake/Galveston Bay you may remember a charter trimaran called Ultra. It was kept in South Shore and usually motored around the lake with its sails up. It’s here docked behind us. We’re not sure where we’re going next. Tomorrow the temps are forecast to be around 97 (today it was 94) so it’s tempting to stay here and find some air conditioned building to sit in. Thursday the high temperatures are supposed to drop to the high eighties.